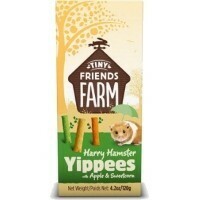 Supreme Tiny Friends Farm Harry Hamster Yippees with Apple & Sweetcorn have been designed to be crunchy and fibrous which helps encourage gnawing to help keep teeth healthy. These long lasting treats can be fed to your hamster by hand or/and can be hidden around the habitat for extra fun. Supreme Tiny Friends Farm Harry Hamster Yippees are made to the highest of quality and standards, making these tasty treats simply irresistible to your furry friend. Wheat Flour, oatmeal, soya oil, whole wheat flour, sugar, carrot, apple (min 9% in green stick), flaked maize (min 9% in yellow stick), coloured with EC additives. Suitable for all Rabbits, Guinea Pigs, Hamsters, Chinchillas, Gerbils, Mice & Rats.